I’ve heard them called $10 Dollar Words, Ivy League Words and just plain “big.” For whatever reason, every now and then I come across a word that makes me grin and grabs my attention for no other reason than that it’s intrigues me. In other words, it’s just plain fun. I therefore feel compelled to do a countdown of my Top 10 All-Time Favorite Words for my Intentionally Vicarious friends. Number 10: Lugubrious – Which means exaggeratedly or affectedly mournful, dismal or gloomy. We’ve all know somebody, at our workplace for example, whose problems are soooooo much tougher than anybody eles’s. I always think of my old colleague Norty B, that lugubrious co-worker whose life should be made into a country song. Number 9: Salubrious – What a great follow-up for the potentially lugubrious mood I’ve put you in! Salubrious refers to something favorable to or promoting health and/or well-being. Lugubrious old Norty needs recognize the many salubrious aspects of life that are surging all around him. Number 8: Mellifluous – Something that has a smooth, rich flow. Saying lugubrious, salubrious and mellifluous one right after the other is in itself quite mellifluous! Number 7: Egregious – OK, yet another that ends in “ous,” but this time without an “l.” I like it not only because of the way it sounds, but also because of the way it’s spelled. E-G-R-E-G-I-O-U-S. My brain has just never been able quickly translate this word when I see it in print. And I see it in print all the time. The news is filled, every day, with stories and events that are extraordinary in one or more bad ways; glaring; flagrant. In other words egregious. Number 6: Sisyphean – This one relates to or is suggestive of the labors of Sisyphus. According to the ancient Greeks, he was such a jerk in life, that he was condemned to eternally roll this huge rock up a long, steep hill only to have it roll back down as he got it almost to the top. Over and over and over… How many people do you know that seriously deserve a similar fate? Ever found yourself slaving away at some sisyphean task? Number 5: Stultiloquence – Stultiloquence is senseless or silly talk. Babble. It sounds just close enough to the word eloquence, that you can imagine yourself smiling broadly, shaking hands with some slimy politician following a campaign speech, noting his amazing stultiloquence and having him thank you for the perceived compliment. Personally, I can’t wait for the next opportunity to pull this one off. Your amazing stultiloquence has absolutely changed my decision regarding who will get my vote. Ha! Number 4: Fress – We’ve all done this. I did it last week at a charity event reception with bacon-wrapped cheese balls, and last night with a box of Girl Scout Cookies. To fress is to eat or snack, often or in large quantities. Fress not, my dear listeners! …or you’ll wind up looking like a beached whale. Number 3: Borborygmus – Borborygmus is something you often get after fressing. It’s an intestinal rumbling caused by moving gas. This is also one of those Latin-derived words that has its plural formed by ending it with the letter “i.” As in, I was plagued by borborigmi twice this month. Once after the bacon cheese balls and again after all those Girl Scout cookies. Number 2: Oblivescence – This one can and must become part of the vocabulary of all my fellow baby-boomers. Oblivescence is the process of forgetting. As in, if not for the incessant oblivescence, I would stop putting my car keys in the refrigerator. 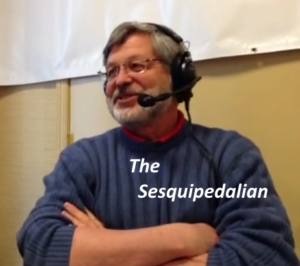 Number 1: Sesquipedalian – Without a doubt, Sesquipedalian is the greatest Big, $10 Dollar, Ivy-League word in history. A sesquipedalian is a person who regularly uses Big, $10 Dollar, Ivy-League words. How awesome is that? And it’s versatile! It’s also proper to use this word as an adjective. Given that I often use sesquipedalian terminology, be I in a lugubrious mood or in a more salubrious environment, subject to fress-induced borborigmi or not, enjoying myself or engaged in yet another Sisyphean endeavor necessitated and catalyzed by the egregious stultiloquence of the new governor and in the face of nearly overwhelming oblivescence, the fact that I strive to employ mellifluous speech at all times, justifies my self-description as an aspiring sesquipedalian. Schadenfreude – satisfaction or pleasure felt at someone else’s misfortune.